Acknowledgment: Special thanks to Hans Petermann of San Diego, California for his assistance in providing research materials and proofing the text. Special thanks to Ed Shook for his providing the invaluable materials on the early history of the 8th. Also thanks to Dave Bradburn for his narratives. Thanks to the marvelous historical site of the 3rd Wing History Office of Elmendorf AFB, AK for its historical materials. We are deeply indebted to the Joe Baugher website for its wealth of historical information on aircraft. Major source of information: History, 8th Bombardment Squadron (L), 3d Bombardment Group (L) AAF, 31 May 1917 - 31 March 1944 (Compiled September 1945). The Squadron insignia was adopted in February 1924. The official description is as follows: "An American Eagle with outspread wings, clutching the top of the Liberty Bell super-imposed upon a ring target." This insignia was chosen because the 8th was the first American Air Service unit to use the deHavilland DH-4 aircraft in combat, powered by the famous Liberty engine. The Liberty Bell and the American Eagle have always symbolized America's stand for freedom. 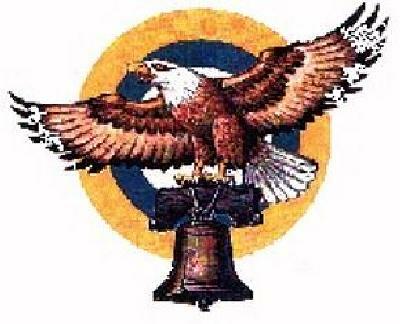 The combination of Air Service, the Liberty Bell, the American Eagle and the Liberty engine all contribute to make this an appropriate insignia to be officially adopted by the 8th Squadron. The quasi-official motto was "The Liberty Squadron" from the days of its inception flying the deHavilland DH-4 "Liberty Plane." This motto was resurrected in the Vietnam period with the 8th Special Operations Squadron flying A-37Bs. Unofficial Motto: "The Friendly Eighth." This motto was used throughout the Korean Conflict. However, how it came about and exactly when it started being used is unknown. 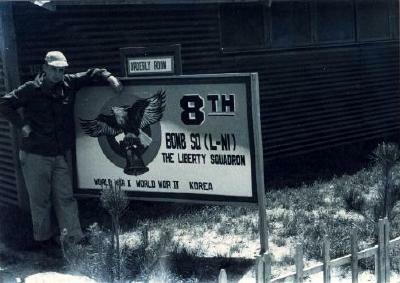 David D. Bradburn, M/Gen, USAF, Ret wrote, "The 8th was called "The Friendly 8th" for no reason that I know of, as early as fall of 1950 at Iwakuni, where there was a sign with that inscription in the bar. So this moves it back a little, but doesn't say, 'Why.'" During the Korean War during 1952, the squadron started using a new version of the Liberty Eagle and it started to appear on squadron signs in K-8 and on the squadron hats. After the Korean War, the B-57 pilots wore the emblem on their flightsuits or on the organizational caps. When the squadron was deployed to Vietnam, it proudly took the Liberty Eagle with it. When the unit transitioned to A-37Bs in Sep 1970, the emblem was still with the unit. However, the squadron assumed the nickname of the 604th SOS, "RAPS" when it took over its equipment and men at Bien Hoa, Vietnam. 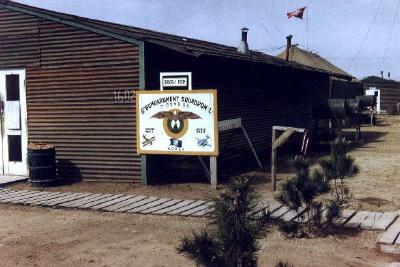 In 1972, the 8th Special Operations Squadron became a "paper unit" without men or equipment and in 1973, its designation became the 8th Fighter Squadron for administrative purposes. 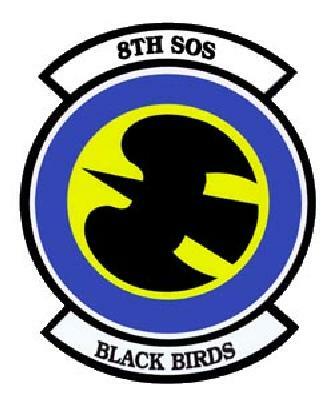 Finally in 1974, it was redesignated as the 8th Special Operations Squadron again. It moved without men or equipment to Hurlbert Field at Eglin AFB, Florida in Mar 1974. The motto "Black Birds" came from the Vietnam War years when the MC-130E first started operations. Painted black for its special operations roles, the aircraft was viewed with awe and wonder. The 8th Aero Squadron was organized on June 21, 1917 at Kelly Field, Texas for hasty training. It was hurriedly sent by train to Selfridge Field, Mount Clemens, Michigan in July 1917. Along with the 9th Aero Squadron, they constructed the field. For three-and-a half months, they trained cadets, aviation mechanics, fitters and riggers. The squadron left Selfridge Field on October 17 for Garden City, New York arriving on October 28. According to the Narrative History, 1917-1941, the time at Garden City was spent in "perfect discipline." On November 22, the squadron boarded the Royal mail ship, Carpathia, and arrived in Liverpool, England 16 days later. After a three-week rest stay, the squadron was divided into four sections and sent to different Royal Aviation Training Centers. On December 8, 1917 the unit arrived at Dartford, England while Transportation went to Ruislip; one flight to Thetford, one flight to Wyton and one flight to Joyce Green, Northolt, England. From there it moved to Ourches, France on August 1918; Toul, France Sept 1918; Saizerais, France October 1918. It distinguished itself with WWI Campaigns in the Toul Sector, Chateau Thierry, Lorraine, St. Mihiel and the Argonne-Meuse first and second offensives. In these actions it flew combat missions as a Corps observation unit with the IV and VI Army Corps from August 25 - November 11, 1918. The Armistice was signed on November 11, 1918. In the post-War period, the unit moved to Colombes-les-Belles, France in February 1919; and then on to Fargues-St. Hilaire, France from February 22, 1919 - April 18, 1919. Planes and all necessary materiel for active service were supplied by the Firat Air Depot, Colombes Les Belles, and a small part of the transportation obtained from Langres. The prescribed quota of transportation was never received by the Squadron and more than once the efficiency of the Squadron was impaired by the shortage. 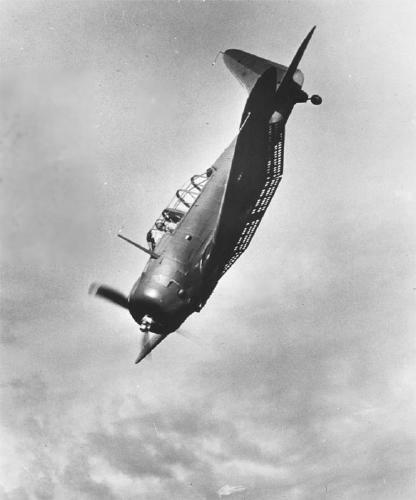 While at Amanty, advantage was taken of the short distance from the lines, and a fortnight period of intensive training was engaged in, which included flights into the enemy's territory. On August 21, 1918, the Squadron moved by truck to Ourches, Meuse. On this day as a result of a flat turn and a crash, 2nd Lt. Edwin R. Kingsland was killed and Cpl. Hand, who was riding with him, seriously injured. 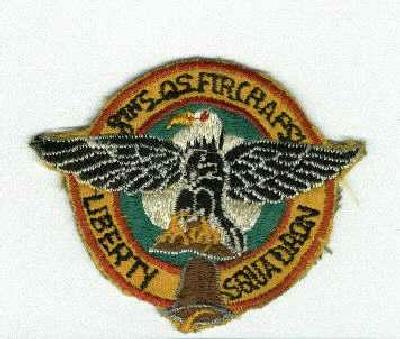 The 8th was the second Liberty Squadron to reach the front. The Squadron engaged at once in active service, and on September 12 and 13 took part in the 'operations against St. Mihiel Salient. (3). Lieutenants H.B. Rex and W.F. Gallagher were killed during this engagement, and Lieutenants H.W. Mitchell and J.W. Artz reported among the missing. Later, it was found that Lt. Mitchell was shot down over the lines in a fight with a Hun. He was unhurt; Lt. Artz was slightly wounded. Because of the shortage of observers at this critical time, the Squadron Commander, taking advantage of paragraph l342.5, Army Regulations, placed Sergeant First Class Phillip G. Smith, sergeant E. O. Cook, and Sergeant Frank W. Noal on flying status, and used them as aerial observers. On his fourth flight, Sergeant Noal was killed with Lt. Frank B. Hollingsworth, shortly after the St. Mihiel attack. This accident happened as they were leaving the field on a reconnaissance mission. The pilot made a flat turn, spun to the ground and crashed. Both pilot and observer were instantly killed. 'Ihe other two non-commissioned officers performed excellent service over the lines. Each of them is officially credited with the destruction of an enemy airplane. While at Ourches, 2nd Lt. Paul W. Chase and 2nd Lt. Ray Smith were given official credit for the destruction of a Boche plane. On September 29, 1918, the entire Fourth Corps Group moved up to Toul Aerodrome, which is situated about two kilometers northeast of Toul, Mourth, Et Moselle, France. The Squadron remained here little less than a month. During this time considerable work was accomplished. At the suggestion of Col. Kahn, two photographic planes were sent out on single missions with protection, instead of one machine. On such a trip made September 25, a string of pictures covering some forty kilometers were taken. This was one of the longest, if not the longest strip photographed by an American Observation squadron on a single mission. One of the duties assigned the Squadron at this time was to photograph the entire Corps front to a. depth of ten kilometers, an area of six hundred square kilometers. A large part of these pictures had been taken before the Squadron was transferred to the Sixth Corp. On October 9, 1st Lt. Edward R., Moore and 1st Lt. Gardner P. Allen while on a photographic mission displayed extraordinary heroism for which they were later awarded the Distinguished Service Cross. The next day, one of the best teams in the Squadron, 1st Lt. Robert J. Cochran and 1st Lt. Claude S. Garrett, Flight commander of Flight "C" were brought down in flames while taking pictures. They, with three other planes, were attacked by twenty-six Boche. Three of these Boche were brought down, two by Sgt. F.G. Smith and one by Lt. S. Chambers. These two officers had won the respect and admiration of both officers and enlisted men of the Squadron. Their death was a real loss to all. Before leaving Toul, 2nd Lt. Jacob D. Halstead was transferred to the Group as Post Adjutant, 2nd Lt. Charles W. Richard was made Group Radio Officer. Both officers had been active helpers in making this an efficient organization. Lt. Walter Bender was relieved as Squadron Operations Officer and made Squadron Adjutant. Lt. M. G. Riley was appointed Squadron operations Officer. On October 23, the squadron was moved to Saizerais and attached to the Sixth Army Corps, where shortly after arrival it was joined by the 354th Aero squadron. This squadron had just arrived on the front and in order to place experienced flyers in the Squadron, Major McNarney ordered seven pilots and seven observers transferred to the 354th Squadron. Lt. H.P.. Young was appointed Operations Officer and Lts. A. C.Rothwell, T.H. Menke and I.D. stone were made Flight Commanders. While at Saizerais and before the Armistice was signed, five officers were lost. Lts. Walker Royce and J.J. McVaine, and Lts. Clark Robinson and R.O. Watson were missing over the lines. All four, it was later learned; were taken prisoners; 1st Lt. Alex R. Dean was killed in an airplane accident, while attempting to accomplish an Infantry Liaison exercise with Corps Troops. Both at Toul and Saizeraia a number of voluntary bombing missions were carried out. These met with success. While at Saizerais, one Hun machine was destroyed and officially credited to Lt. F. B. Fort and Sergeant B.B. Cook. The Squadron was actively engaged on the front for two and one half months and during nine hundred hours of flying had only one forced landing. Not a single case arose that required a court-martial. The enlisted personnel did cheerfully and well every task assigned to them. The total losses were eight killed, three injured, and six missing. All that was given to the Squadron, was done, and done to the limit of its ability. On February 5, 1919, G-3 order.s NJ. 129, Headquarters, 2nd Army, were received relieving the Squadron from the. 2nd and 6th Army Corps and assigning it to the advance section, S.O.S., with instructions to proceed by truck train to Colombes les Belles, France, for preparation to return to the United states. This was hailed with joy by every member of the organization as it was realized that they were not doing any good where they were since the Armistice. However, a great deal ~of regret was felt, as the organization was such a splendid one. To think of its dissolution as a unit was sorrowful, but "c'est La Guerre". 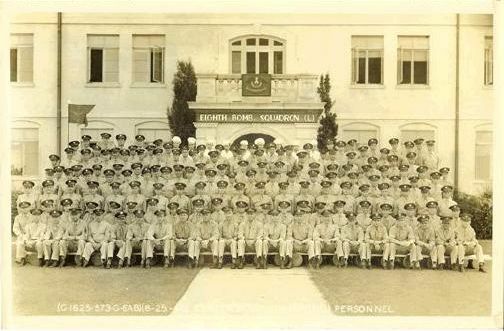 When this order was received the organization had nineteen pilots and twenty-four observers on its rolls and fourteen planes in addition to the usual ground officer personnel. Under G.H.Q. orders, only ten officers were allowed to be taken with the Squadron so it became necessary to detach the surplus officers. The planes were to be delivered to N.S. Production Center at Romarantin, France, a distance of about four hundred miles from the airdrome. One plane, however, was transferred to the 354th Squadron, leaving only thirteen planes to be disposed of. On February 8, 1919, the start was made in two formations of six and seven, taking off in six inches of snow at about 9:00 A.M. in almost zero weather. The Flight Leaders were given orders to land at Orley near Paris for gas and oil and then proceed to their destination. One plane was forced to land because of losing the drain plug from its water pump while in the air. A safe landing was made, however, and the plane was later flown to destination. By 9:00 P.M. February 8, 1919,. all planes had been heard from and were safe. The 8th Aero Squadron was a ground unit. During most of March and during the time Captain John G. Winant had been in the hospital and absent on leave, 1st Lt. Walter Bender was in command. Another problem which presented itself was the disposition of the Squadron property. With the assignment of 2nd Lt. Rayburn S. Webb as Supply Officer, this was soon accomplished. On February 10, all the pilots who had flown planes to Romarantin had returned, and orders were issued sending them to the 1st Air Depot for duty and return to the united states. On February 11, everything was in readiness and the move to Colombes les Belles was made by truck. Here the squadron was quartered in Adrian Barracks and immediately put on fatigue with other squadrons preparing the depot for inspection by General. Pershing. On February 16, Captain Winant was relieved of command and. Lt. Bender assumed command. 'Ihe same date Lt. Raymond Sanderhoff was sent as advance party to Bordeaux to prepare for the Squadron's arrival. On February 19, the Squadron entrained at Barisey-la-Cote, for St. Andre-de-Culizac. Seven box cars were assigned the Squadron for officers and men. Five days were consumed on the move to Bordeaux where, upon arrival, billets were assigned to officers and men in the small village of Forgues-st. Hilaire. The billets were the usual French rooms but the men were very comfortable. The Squadron Commander and his Adjutant were, assigned one of the largest chateaux in the village, splendidly furnished and equipped with billiard tables and a huge library . The squadron remained here until April 19, 1919 spending the time in preparing for embarkation. The records of the squadron were brought up to date. From six to eight hours daily were spent at drills and tactical marches. 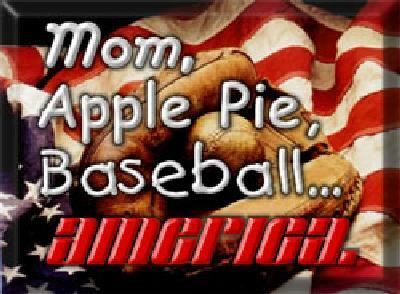 A baseball team was organized and some good games played and won. Everything possible was done by the townspeople to make our stay pleasant and we left this village with regret. The Squadron remained here until April 19 and then moved by marching to Camp Genicort, a distance of about ten kilometers, and went through the delousing mill the same day. The next few days were days of work and sleep for officers and the office force as the volume of typewriter work was mountainous. Here seven officers were relieved from duty with the Squadron, leaving only three officers to return to the United states with the organization. On April 20, 1919, the reign of terror of final preparation for return was completed and found the squadron on board - the U.S.S. "Pastores" with the shores of La Belle, France, receding in the distance. The crossing was made with fine weather and on the evening of May 1, the Lady of Liberty was sighted, thrusting her candle above the horizon. The Squadron was once more in the land of its birth. On May 2, 1919, the Squadron debarked and moved by ferry and train to Camp Mills, Garden City, and was once again deloused. On May 3, the organization moved to Mitchell Field, Long Island, and the work of transferring the enlisted men to different cantonments for discharge commenced. This was completed by May 20, and the Squadron then consisted of one officer, 1st Lt. Walter Bender, and eight men, all of whom were on furlough. On May 20, orders were issued sending the squadron to Kelly Field, Texas, for station and duty, at which place it arrived on May 25, consisting of one officer and records. On May 31, 2nd Lt. F. Taylor was attached to the Squadron, assuming command, and Lt. Bender left for Los Angeles on a thirty-day leave. During June 1919, the eight men who had been on furlough reported back to the Squadron and were immediately transferred, leaving the Squadron with one officer on leave and one officer attached for the personnel. During WWI, the 8th Aero Squadron was engaged in active combat through out France for over two and a half years. They logged over 900 combat hours on photographic/bombing missions in the DeHavilland DH-4, "Liberty Plane", with only one forced landing and four enemy aircraft kills credited. "The versatile de Havilland DH-4 played many roles in both military and civilian capacities. In addition to its bombing activities in World War I, the DH-4 was an observation and photoreconnaissance aircraft. Between the Wars, one of its most important tasks was aerial mapping for the Army Air Service." The DH-4 was introduced in England in 1917. Because of the War, time for new aircraft development was limited, so an American version of the already existing aircraft was produced in this country. More than 4000 DH-4s equipped with the American Liberty Engine were manufactured in the U.S. by 1919. The Air and Space Museum's aircraft is the first of these to be built. After the War, modifications were made to correct design and safety flaws and the "Liberty Planes", as the DH-4s were called, were used in many fields, including forest patrols, geologic reconnaissance, and aerial photography. The Army Air Service was called upon to supply the Army Corps of Engineers and the Geological Survey with aerial photos for mapping and stereo viewing. The DH-4 was the most suitable and, because of its great numbers, the most available plane for the job. It was used as the standard airplane for the purpose for 10 years. Aerial cameras in the DH-4 could be hand-held or mounted either inside or outside the rear cockpit. The aircraft on display contains a Kodak L-4 camera positioned within the cockpit to take photographs through a small window in the floor. "Why," wondered National Air and Space Museum Director Walter Boyne, was "the United States, which had given birth to the airplane ... so absolutely indifferent to its development [before WW-I]?" Then he goes on to tell us about the deHavilland DH-4. By the time war began in 1914, Germany had spent 45 million dollars on military aviation, Russia 23 million, and France 13. America had spent hardly 400 thousand dollars on military aircraft. Boyne answers his own question. There was no apparent money in aviation. We'd invested everything in railways and highways. All we had was the Curtis Jenny. In 1915 it went to war, not against Germany, but against Pancho Villa in Mexico. Eight Jennies and ten pilots were no match for the harsh Southwest. Jennies weren't meant to go more than about fifty miles from their base. They crashed and got lost. Pershing never did catch Pancho Villa. When we finally entered the War, we appropriated 13 million dollars for airplanes and went to the European airplane builders for designs. The British deHavilland Company had built a series of airplanes, the best of which was the Rolls-Royce-powered DH-4. The British finally sent us one to use as a template. So we set out to build DH-4s. In the end, we spent 640 million dollars on them. We switched from the British system of hand-crafting airplanes to our automobile production methods. We developed our own so-called Liberty Engine -- a large 400 HP water-cooled V-12 machine. 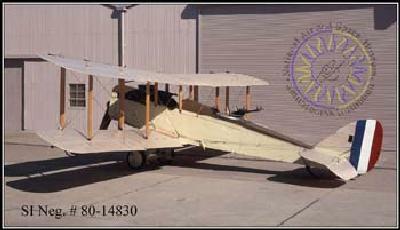 The American-built DH-4 was renamed the Liberty Plane. At first it had so many design bugs people called it The Flaming Coffin. When my father joined the Air Service, late in the war, he trained in Jennies. The Liberty Plane never did reach him. But it did reach France in May, 1918. The DH-4's combat service was not distinguished. It was far too ponderous to dogfight the German Fokker triplanes and biplanes. It didn't carry enough load to be a useful bomber. It was a clear matter of too little and too late, but there's more to the story. Thousands of DH-4's were left in America on Armistice day, and even more Liberty Engines. The DH-4 hadn't been worth much in combat, but it was a big solid stable biplane with a tubular steel frame and what turned out to be a fine engine. When you crash-landed a DH-4, you walked away alive. Right after the war, the Army began airmail service with DH-4s. DH-4s with skis served in the Arctic. Engineers modified them every way imaginable. The Liberty Engine was so good we relied on it instead of moving ahead. It probably slowed American aircraft engine development. And so the DH-4 takes a strange place in aviation history. It couldn't stand up to the famous WW-I airplanes. Yet the forgotten DH-4 was still in service when all that remained of Fokkers and Spads were the legends that lingered after them. On September 15, 1921, the designation of the Group was changed from 1st Surveillance Group to 3rd Group (Attack). The 3rd Attack Group returned to Kelly Field in 1921 where it underwent an extended period of training. 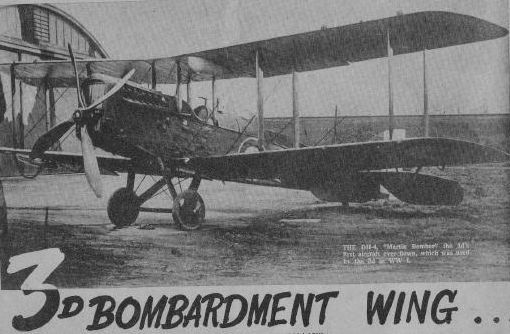 The Squadron received on January 20, 1921, one of several armoured bi-motored triplanes assigned to the Group. These planes were designed especially for attack work and officially designated as GAX (Ground Attack, Experimental). The outstanding features of these planes were the armoured protection for motor and personnel, and mounting for a small rapid fire cannon: Experiments proved this type , plane unsuitable for attack work and later they were discarded. On May 26, 1922, a long-distance one-man non-stop record was set when Lt. Crocker when he made a non-stop flight from the Mexican Gulf to the Canadian Border, an approximate distance of 1200 miles, to demonstrate the mobility of the Air Service. The course was from Ellington Field, Texas to the waters of the Gulf thence to the Canadian border just below Detroit, Michigan, landing at Selfridge Field. This distance was greater than from some other cities along the Gulf, but since a large field was necessary for the heavily-laden plane to take off, Ellington Field was selected as the starting point. The plane used was a special built De Havilland and designated as DH4B1S. The main tank had a gas capacity of 240 gallons and the reserve 28 ) gallons, with a 24 gallon tank for oil. Taking off on May 26, he landed at Selfridge after 11 hours and 55 minutes in the air. In June 1922, the squadron provided flood-relief in the lower Rio Grande Valley. A commendable piece of work was done by Lt. Selzer in July, 1922, in connection with the Rio Grande flood at McAllen, Texas, in carrying mail to towns without the, usual rail connections, assisting in locating marooned parties caught by the rapid rising waters of the Rio Grande River, and in cooperating with the other military authorities of that. station during the critical time. "Despite its successes, the 3rd Attack Group suffered from limited budgets at the time. When Major Lewis Brereton, who would later command the Far East Air Force during the early days of World War II, assumed command in February 1923, he had to contend with the inactivation of two squadrons and the limitation of flying hours. However, the Army began to expand in 1926, resulting in the reactivation of a squadron. The group now consisted of the 8th, 13th and 90th Attack Squadrons, an association that would last until 1964." On January 25, 1923, the unit was redesignated as the 8th Attack Squadron. In February 1924 the squadron's official insignia was adopted. The official description is: "An American eagle with outspread wings, clutching the top of the Liberty Bell superimposed upon a ring target." The insignia was chosen because the 8th was the first American air service unit to use the DeHavilland DH-4, "Liberty Plane", in combat. The combination of air service, the American Eagle, the Liberty bell, and the "Liberty Plane" all contributed to make this an appropriate insignia for the 8th. On June 27, 1924, the Squadron was reorganized and placed on a reduced strength status of sixteen officers and ninety enlisted men from the former strength of twelve officers and 132 enlisted men. Experiments proved the wing guns as practical and all planes of the organization, excepting special cross country planes, were equipped with wing guns during February 1925. Move to Fort Crockett, Texas On June 28, 1926 the squadron moved from Kelly Field to Fort Crockett in Galveston, Texas. The organization's planes with necessary personnel were flown, in advance. The remaining troops were convoyed by truck. During it stay at Fort Crockett, the group was called on often during its nine-year state at Fort Crocket to participate in air maneuvers, demonstrations and air races. During this time the squadron also flew many other types of aircraft. These aircraft included the GAX (GA-1) in 1923; O-2 1926-1928; A-3 1928-1934; Curtis A-12 Shrike 1934-1936 (including Curtis A-8s & O-19s during 1932-1936); and Northrop A-17 1936-1940. During this period, it participated in a great amount of work in connection with "experiment, practice and development of aviation in in general and attack aviation in particular. It progressed from the DH-4B type aircraft to the A-12, which was the immediate forerunner of our A-17 and A-17A." (Source: Invader, news article, date unknown, Jack Lewis.) The Squadron was involved in the development of light bomber tactics specifically. The 3rd Attack Group pioneered low-level attack and close air support procedures. It continued flying the deHavilland DH-4 until 1926. At Fort Crockett the squadron began flying the Curtis A-3 Falcon in 1926. It boasted four forward firing .30-caliber machine guns and another two on a flexible mount in the rear cockpit. Powered by a 430-horsepower engine, the Falcon could carry 200 pounds of bombs attached to wing racks. Although carrying a lighter bomb load, the A-3 proved better in the attack role than the DH-4. The A-3B replaced the A-3. In 1934 the aircraft would be used to carry mail. The photos above were taken on maneuvers to Mather Field, California. On March 27,1930, a flight of nine planes left to participate in maneuvers. The 3rd Attack Group resumed border patrols briefly again in 1929, after unrest erupted in Mexico. It deployed 18 of its aircraft on patrol along the Mexican border with Arizona in early April. The patrols lasted until early May when the situation in Mexico stabilized. After the border patrols ended, the squadron resumed its training activities at Fort Crockett. 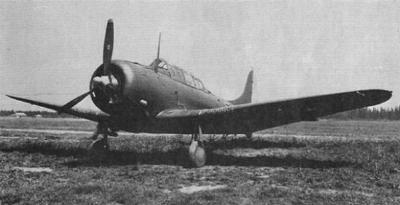 It also flew the YA-8. On November l, 1932, Captain Lotha A. Smith departed for Rockwell Field, California for the purpose of participating in service test flight of the YA-8 airplanes, returning to Fort Crockett on November 7, 1932. 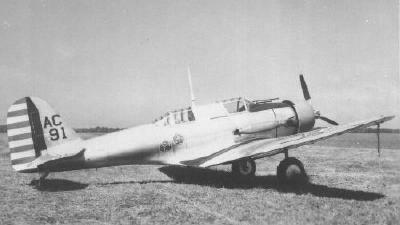 The YA-8, then an experimental plane, was considered the deadliest weapon of the air corps for use against ground troops. It had a speed of about 200 miles per hour. In addition to six machine guns it carried a demolition bomb between the landing wheels. A squadron of these planes was said to equal the artillery and machine gun fire of a full infantry division. The A-8 was the first three propellor plane used by the group and was the type that Lt. Col Horace M. Hickam, commander of the 3rd Attack Group, was flying when he crashed while landing at the Fort. On January 5, 1932 the organization received its first A-12 attack airplane from the Curtis factory, Buffalo, N.Y., piloted by Captain A.H. Foster. By the last of January the Squadron had ten A-12s and four A-3Bs assigned. 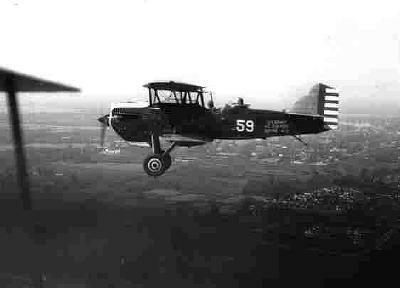 By late 1932, the 3rd Attack Group had upgraded to the Curtis A-8 Shrike. The low-wing monoplane represented the rapid advance in aircraft technology being achieved despite the economic difficulties of the Great Depression. It carried 400 pounds of bombs and was armed with five .30-caliber machine guns. The group received the A-12 Shrike, an improved version of the A-8, the next year. Mail Service On February 12, 1934, in compliance with Executive Order 6591, dated February 9, 1934, the organization began preparation for duty in connection with carrying the Air Mail. The Army Air Corps agreed to carry the US mail following a government dispute with the commercial carriers. When the Air Corps started to carry the mail in 1934 the 8th BS was one of the first Squadrons selected to be used in this capacity. However, the 3rd Attack Group commander, Lt. Colonel Horace Hickam, complained that his pilots were not trained and equipped for the job, a concern shared throughout the small Air Corps at the time. On February 13, 1934 three A-12 airplanes departed for Oakland, California. On February 14, a flight of nine A-l2s 1eft for Omaha, Nebraska. All pilots and airplanes were given practice runs before actually carrying the mail. On.February l6, 2nd Lt. Jean D. Grenier, while making a practice flight over the Salt Lake City -- Cheyenne air mail route, crashed on the western slope of the Rocky Mountains, 35 miles east of Salt Lake City. 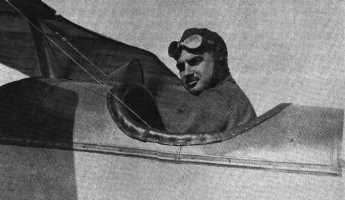 Lt. Grenier and passenger were killed and the airplane was demolished. The 3rd Attack Group lost two of its pilots on the air mail route between Salt Lake City and Cheyenne during the winter of 1934. On May l5, the Army terminated its connection with the carrying of the mail and personnel and planes began returning to station. . The Squadron returned to its routine duties. On October 31, 1939, the 8th Attack Squadron was awarded the Harmon Efficiency Trophy for being the most efficient organization in the 3rd Wing, General Headquarters Air Force, during the Fiscal Year ending June 30, 1939. The 8th Attack Squadron also received 13 Curtis A-18 Shrike II's. This two-engine attack plane represented a technological advance. It carried 20 fragmentation bombs in the fuselage and up to four 100-pound bombs under its wings. 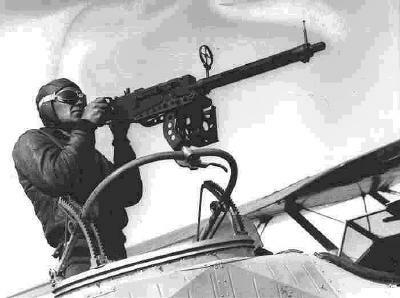 Four .30-caliber machine guns mounted in the nose provided concentrated fire for strafing ground targets. It performed well, wining the Harmon Trophy for gunnery and bombing accuracy during its first year of operations. In September1939, the Squadron was assigned the B-18A aircraft. It was a Douglas light Bomber powered by twin-engined Wright Cyclones. The Army redesignated the 3rd Attack Group as the 3rd Bombardment Group (Light) on 15 September 1939. On September 15, 1939 the Squadron was redesignated as the 8th Bombardment Squadron (Light). On January 31, 1940, the squadron was split in half, both officers and enlisted men leaving to form the 15th Bomb Squadron of the 27th Bomb Group at Barksdele Field, Louisiana. Move to Hunter Field, Georgia On October 6, 1940, the Squadron received orders to pack supplies and equipment for a change of station to Savannah, Georgia. , One officer and 100 enlisted men departed from Barksdale Field on troop train, while11 officers and 54 enlisted men departed by privately owned vehicles. The men by troop train arrived at Savannah, Georgia on October 8 and set up at the Municipal Airport. The remainder of the personnel arrived on October 10, 1940 and the Squadron began ferrying aircraft to the National Guard Armory. By October 20, equipment was set up and operations begun. The airfield was officially named Savannah Air Base. It moved to Hunter Field, Georgia in October 1940. The Eighth continued in this training capacity until October 1940 and during this period participated in all major field exercises and tactical maneuvers though out the country. The 3rd Bombardment Group spent its time at Hunter Field flying anti-submarine patrols and practicing low-level attacks against shipping off the Atlantic Coast. At Hunter Field, the squadron converted to the Douglas A-20 Havoc. On January 10, 1941, the squadron received by assignment its first A-20A, which was a Douglas Light Attack Bomber, powered by 2 Wright R-2600-11 Type , engines. 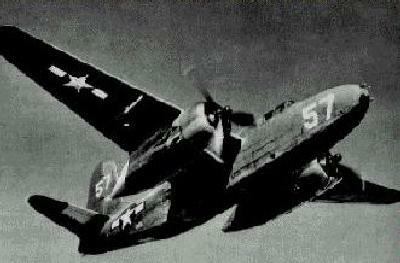 The A-20, which the group would fly during Word War II, represented a considerable technological advance. The A-20A carried 1,100 pounds of bombs and was armed with four 30-caliber nose mounted machine guns and another five in turrets. The Squadron was also assigned a small number of A-24.type airplanes, which was a Douglas Dive Bomber with a Wright Cyclone R-1820-52 engine. During this period, the unit flew the A-18 from 1937-1941; Douglas B-18A Bolo twin-engined light bombers (DC-2/DC-3 Bombers) from 1939-1941; and Douglas A-24 Dauntless from 1941-1942. On January 19, 1941, all personnel of Savannah Air Base were moved into barracks which had been recently constructed. The runway and hangars were still being built at the time. By the summer of 1941, with the possibility of the United States involvement in war becoming even more apparent, the group' focused on preparing for war. During 1941, the squadron was involved in a succession of maneuvers. With the successful maneuvers at Chattanooga,, Monroe, Little Rock and Raleigh behind them, the Squadron resumed normal airdrome duties. On December 1, 1941, 50% of the Squadron personnel were granted a well-deserved leave of absence. Most of the men expected to enjoy spending Christmas at home. However, the situation at Pearl Harbor on December 7, 1941 with the Japanese attack caused all the leaves to be cancelled. The Japanese attack on Pearl Harbor shocked the nation and thrust the U.S. into World War II. All personnel returned to duty and started wartime preparations.